It's been a long time since I started a petition to try to change something in my world. But in recent weeks my local City Council has been threatening to do some silly things related to funding the development of bike and pedestrian paths here, and I'd heard enough people say informally that they were concerned by those threats that I decided it was time to create a central spot where they could put all their names for Council members to see. And that's how I ended up using the petitions.moveon.org service, which has turned out to be excellent for this purpose. While clearly scaled to support national and state level petitions, the MoveOn tool did a great job of enabling a smaller petition targeted at a local legislative body that might not otherwise be in their system. I was able to enter the names and email addresses of my local Council members as "targets" of the petition, and they then were set up to receive deliveries of signatures directly. Related to that, the MoveOn system allowed the targets of the petition to respond directly to the petition signers with a message, without giving them direct access to each others` private contact information. The system automatically picks small signature goals to start with and then scales them up as new milestones are hit. I think this helps avoid the awkward "WE'RE GOING TO HAVE A HUNDRED MILLION SIGNATURES HERE!" declarations by petition creators that quickly yield disappointment. The system offered up interesting summary stats about where signatures were coming from and what activity on the petition looked like over time. When I had to contact MoveOn's petition support (one of the signers had accidentally left out a word in a comment that significantly changed the meaning, and wanted it corrected) they were fast to respond and provided a quick solution. Other features in the petition tool, like handling delivery via print and email, contacting petition signers, "declaring victory," and more seemed really well designed; simple, effective, built for bringing about real action. The petition application is open source and available for anyone to contribute to it. 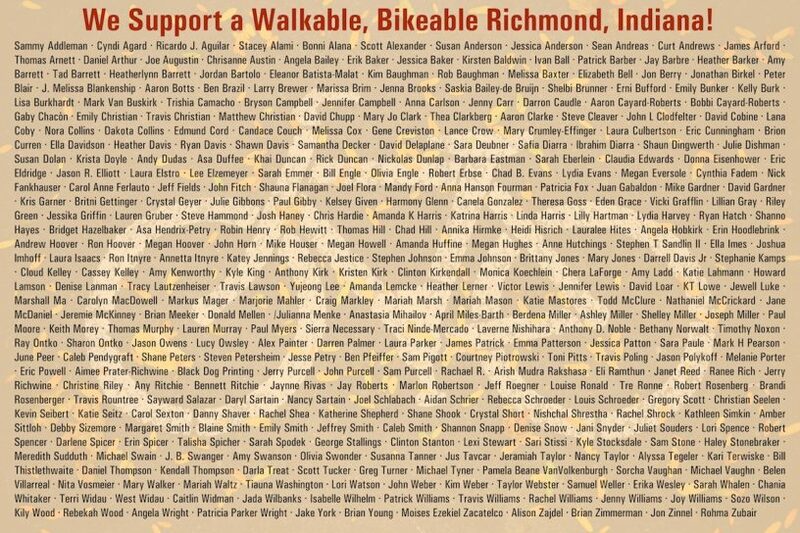 One of the things I wanted to do as the signature numbers climbed and as I prepared to present the petition to Council was create something that visualized the signing names in one place. 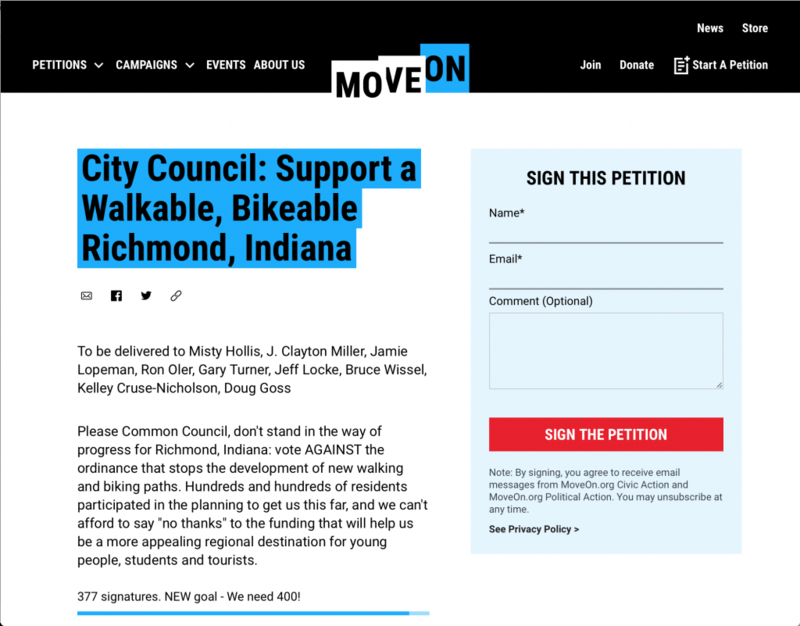 The signature count on the petition itself was not super prominent, and in only displaying 10 names at a time it was easy to miss out on the sense of a large part of the local population making a clear statement about what they want. So I sniffed the XMLHttpRequests being made by the MoveOn site and found the underlying API that was being used to load the signature names. I whipped up a simple PHP script that queries that API to fetch all the names, and then does some basic cleanup of the list: leaving out anything that doesn't look like a full name, making capitalization and spacing consistent, sorting, etc. All in all the MoveOn petition platform has been great, and I think it's made a difference just the way I wanted it to. I highly recommend it. I mentioned earlier that I'm using a personal webhook server as glue between various online tools and services, and this post expands on that. For the open web to work well enough to bring people back to it, information has to be able to come and go freely between different systems without relying on centrally controlled hubs. Just like RSS feeds, REST APIs and other tools that allow software programs to talk to each other across disparate systems, webhooks are an important part of that mix. Whereas many of those tools are "pull" technologies - one system goes out and makes a request of another system to see what's been added or changed - webhooks are a "push" technology, where one system proactively notifies another about a change or event that's occurred. Dear app/tool/service developers: if you're going to offer "integrations" with folks like IFTTT, Zapier PLEASE also take the time to directly support the open standards those connections are built on (e.g. REST APIs, webhooks, RSS, CalDav, CardDav, etc). So I decided that just as I host RSS feeds and APIs for many of the things I build and share online (mostly through WordPress, since it makes that so easy), I also wanted to have the ability to host my own webhook endpoints. I used the free and open source webhook server software. (It's unfortunate that they chose the same name as the accepted term for the underlying technical concept, so just know that this isn't the only way to run a webhook server.) I didn't have a Go environment set up on the Ubuntu server I wanted to use, so I installed the precompiled version from their release directory. This establishes a proxy setup where nginx passes requests for my public-facing server on to the internally running webhook server. It also limits them to a certain number of requests per second so that some poorly configured webhook client can't hammer my webhook server too hard. After that, service start webhook will get things up and running. To add new webhook endpoints, you just add on to the JSON configuration file. There are some good starter examples in the software documentation. I strongly recommend using a calling query string parameter that acts as a "secret key" before allowing any service to call one of your webhook endpoints. I also recommend setting up your nginx server to pass along the calling IP address of the webhook clients and then match against a whitelist of allowed callers in your hook config. These steps will help make sure your webhook server is secure. Finally, I suggest setting up some kind of external monitoring for your webhook server, especially if you start to depend on it for important actions or notifications. I use an Uptimerobot check that ensures my testing endpoint above returns the "webhook is running" string that it expects, and alerts me if it doesn't. If you don't want to go to the trouble of setting up and hosting your own webhook server, you might look at Hookdoo, which hosts the webhook endpoints for you and then still allows you to script custom actions that result when a webhook is called. I haven't used it myself but it's built by the same folks who released the above webhook server software. So what webhook endpoints am I using? My favorite and most frequently used is a webhook that is called by BitBucket when I merge changes to the master branch of one of the code repositories powering various websites and utilities I maintain. When the webhook is called it executes a script locally that then essentially runs a git pull on that repo into the right place, and then pings a private Slack channel to let me know the deployment was successful. This is much faster than manually logging into my webserver to pull down changes or doing silly things like SFTPing files around. This covers a lot of the functionality of paid services like DeployBot or DeployHQ, though obviously those tools offer a lot more bells and whistles for the average use case. I use a version of this webhook app for SmartThings to send event information from my various connected devices and monitors at home to a database where I can run SQL queries on them. It's fun to ask your house what it's been up to in this way. For the connected vehicle monitoring adapter I use, they have a webhook option that sends events about my driving activity and car trips to my webhook server. I also store this in a database for later querying and reporting. I have plans to extend this to create or modify items on my to-do list based on locations I've visited; e.g. if I go to the post office to pick up the mail, check off my reminder to go to the post office. I've asked the Fastmail folks to add in support for a generic webhook endpoint as a notification target in their custom mail processing rules; right now they only support IFTTT. There are lots of neat possibilities for "when I receive an email like this, do this other thing with my to-do list, calendar, smart home or website." Speaking of IFTTT, they do have a pretty neat recipe component that will let you call webhooks based on other triggers they support. It's a very thoughtful addition to their lineup. I'm not expecting many folks to go out and set up a webhook server; there's probably a pretty small subset of the population that will find this useful, let alone act on it. But I'm glad it's an option for someone to glue things together like this if they want to, and we need to make sure that software makers and service providers continue to incorporate support for webhooks and other technologies of an open, connected web as they go. At various times in my professional life I have been someone who builds software, someone who leads other people who build software, someone who sells and translates the power of custom software to clients, someone who supports the work of people who build software, and someone who tests software as a user. Each role has its joys and challenges, but I've realized that so far I find building software to be the most fun and rewarding of all of them. At the end I've also included links to some books and other reading about software development that I've found useful. There's such a thing as too much planning, but it's rarely something you find in the world of software development. Most people (myself included) who have an idea for a tool, app or other piece of software want to see their vision rendered into a working thing as soon as possible. The excitement about building often drowns out any concern for the details of what to build and how to build it. But I know from experience that if the person who wants the software thing built (the client) is not the same as the person actually building it (the developer), there will almost always be a gap to close between each others` understanding of process, milestones, expectations and criteria for success. Even something as simple as "a website that takes a single text input and displays a message based on that input" can be reasonably interpreted and implemented a hundred different ways. Airmail 3 - my main tool for reading, sorting, sending and finding email across a few different accounts. Replaced Thunderbird with it a few years back, really good choice. Chrome - on the desktop, my daily browser of choice. I tried the new Firefox recently and liked it, but not enough to switch. I have lots of extensions installed but some favorites are Adblock Plus, JSONView and XML Tree, Momentum, Pinboard Tools, Postman, Signal Private Messenger, Vanilla Cookie Manager, Xdebug helper and Web Developer. On mobile I use iOS Safari. macOS and iOS Calendar and Contacts - works with all of the various online calendars and address books I sync to, have stayed pretty intelligent and user-friendly without getting too cluttered. Todoist - for task management and keeping my brain clear of things I care about but don't want to have to remember. Slack - for communicating with my co-workers and others. I have accounts on 11 different Slack instances, and only stay logged in to about 4 of those at once. For just over two years now I've been using Todoist as my primary to-do list manager and personal organizer software. I pay for the upgraded Premium version at US$28.99/year. I really like it and it's helped me stay on top of all the things I want to get done in my professional life, personal life, local community and beyond.